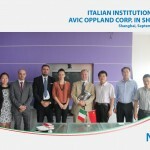 On September 4th 2014 the Consulate General of Italy in Shanghai and the Italian Trade Commission in Shanghai met the delegation of AVIC Oppland Corp., a major Chinese media group covering also on-line news publishing through its branch China Aviation News. The Chinese delegation was represented by the President Mr. Zhiyuan Xiao, the Vice-President Mr. Sun Wei, the Director Mr. Zhang Shen and Mr. Terry Kim General Manager for Aerospace Dept. The Italian delegation was represented by the Consul General Mr. Stefano Beltrame, the Consul Ms. Eugenia Palagi and the Italian Trade Commissioner Mr. Claudio Pasqualucci. The Meeting created an efficient exchange of ideas between the parties involved in order to better promote the Italian aerospace industry in China with the support of the AVIC Oppland Corp. It is very important that the two countries work closely in order to better achieve the results expected by the two governments.